Across these downloads, James Coats and Nicholas Byrd break down the art of pickpocketing. 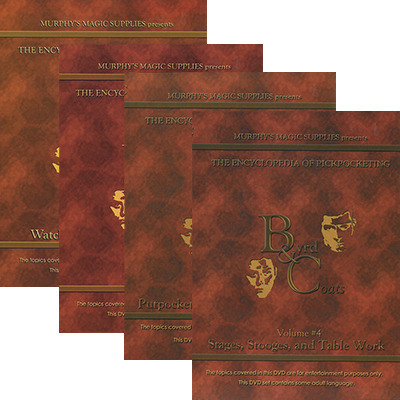 From stealing a watch to explaining how to putpocket, this collection provides a wealth of knowledge which is a must have if you are interested in persuing theatrical stealing and deception. Welcome to the Encyclopedia of Pickpocketing Volume 1 - Watch and Jewelry Removal. Welcome to the Encyclopedia of Pickpocketing Volume 2 - Pickpocketing. Welcome to the Encyclopedia of Pickpocketing Volume 3 - Putpocketing and Shocking Steals. I was worried that pickpocketing would be too daunting to learn but I chanced it by buying this set. I'm glad I did. The teaching was clear and there is a huge amount covered. I've started practicing which is nerve racking but great fun at the same time. Thanks for the recommendation and for making the downloads available individually. After watching Volume 1, I immediately bought the other volumes.